Last year, as part of Saudi Arabia’s drive to advocate for more female participation in sports and develop a more inclusive sports environment in the country, the Kingdom appointed Princess Reema Bint Bandar to head the Saudi Federation for Community Sports (SFCS), making her the first woman in the Kingdom to take on such an important role. Since then, Saudi Arabia has been witnessing the rise of the female athlete in all areas, from football to motorcar racing, kickboxing to scuba diving. To mark this transformative period in Saudi Arabia’s history, particularly in the field of sports, AboutHer.com has put together a list of top Saudi female athletes from across the kingdom. 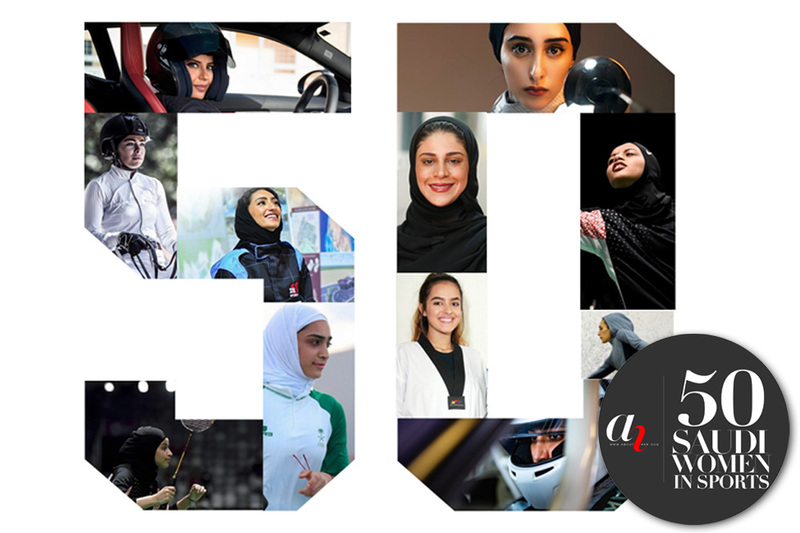 The top 50 list, which celebrates the Kingdom’s most inspiring and exceptional female sports figures, has been compiled by a panel of experts in the field. It comprises a wide range of Saudi female role models such as: Norah Almarri, the first Taekwondo athlete to represent Saudi Arabia in the 2018 Asian Games in Jakarta; Kariman Abujadayel, a sprinter who became the first Saudi Arabian woman to compete in the 100-meter race at the 2016 Olympic Games in Rio de Janeiro, Brazil; and Mariam Fardous, the first Arab woman and third woman in the world to dive in the North Pole. The decision – and consequent initiatives being taken – to actively integrate Saudi women into sports has been credited to Crown Prince Mohammed Bin Salman and his push to realize the objectives set by Vision 2030, an ambitious plan that aims to transform the Kingdom, a key part of which involves reforms targeted towards improving the lives of women. Following the Crown Prince’s ascension to power last year, Saudi Arabia has assigned women to top leadership positions, reformed different facets of its legal structure to give women more rights, created opportunities across various sectors for women, and is transforming its public sphere to be more accommodating to women. Indeed, in 2017, Saudi Arabia allowed female fans to attend sports event in public stadiums for the first time, underscoring the country’s wider efforts to grant women more public visibility. AboutHer.com is a website dedicated to covering stories that highlight the roles and realities of women in Saudi Arabia that often go unmentioned, with the ultimate aim of broadening the narrative of Saudi women in the media. From sports to film, lifestyle to stories that inspire, AboutHer.com addresses the contributions and important role of Saudi women in the Kingdom’s advancement and journey towards modernization.